you save 3 % / 350,00 EUR 19 % VAT incl. 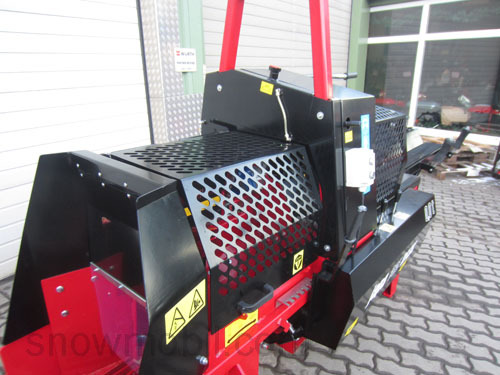 This firewood processor is manufactured and sold in Scandinavia. A sophisticated product with high quality. This machine is primarily for semi-professional use and professional use. The proportion of wood heaters in Scandinavia (in rural area) is about 80%. 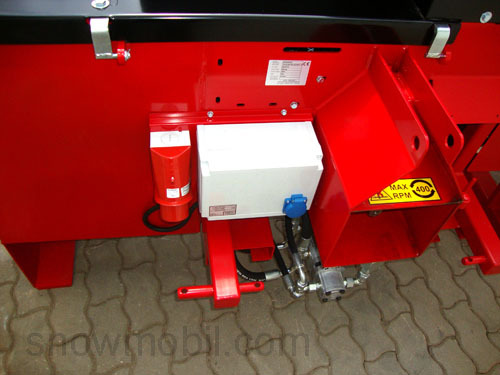 The PTO shaft drives a powerful hydraulic pump, which drives a hydraulic engine via the present oil tank. 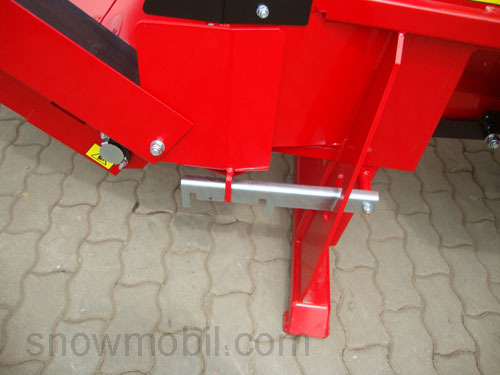 The electric motor runs idle. 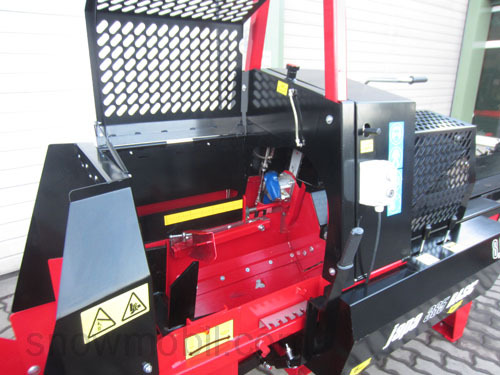 This hydraulic engine serves as drive for the chainsaw. 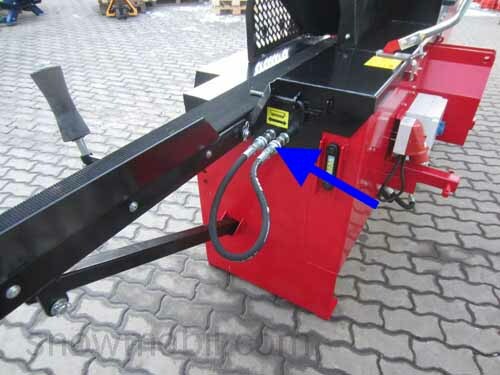 The lubrication of the saw-chain happens via an extra hydraulic oil tank. 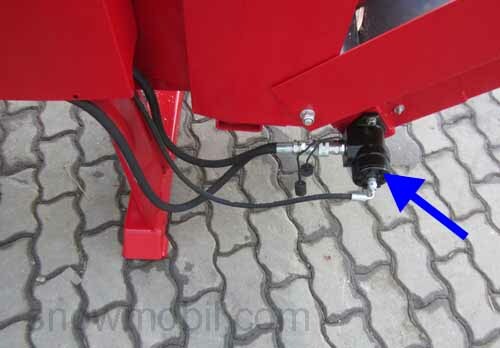 The flow rate can be adjusted via a valve on the top of the splitter. If you push the sword of chainsaw down via the hand lever, the saw chain will be pressed on the tree trunk. After the sawn log of wood falls into the splitting shaft, you push the lever slightly and the lever start the splitter. It splits the log high speed. 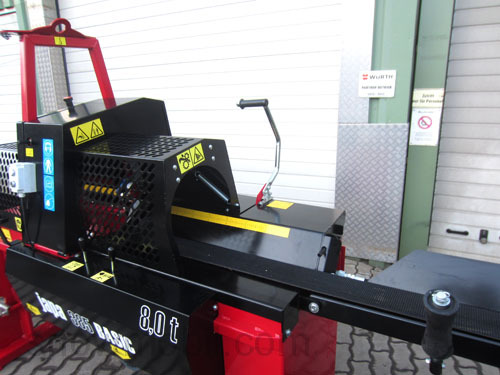 The splitting cylinder responds automatically by a Pressure Control - it splits slower in case of very hard wood and it splits faster in case of soft wood. The wood is pressed against an only 1.5 cm strong power saving, hardened and tempered splitting wedge. If you push the hand lever back, the conveyor belt is on and the trunk is fed up to the stop. 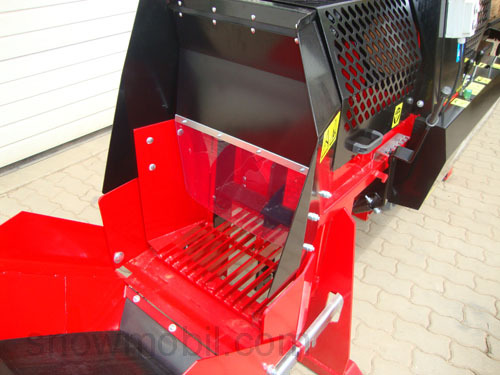 If the firewood processor is powered by the electric motor, the PTO runs idle. 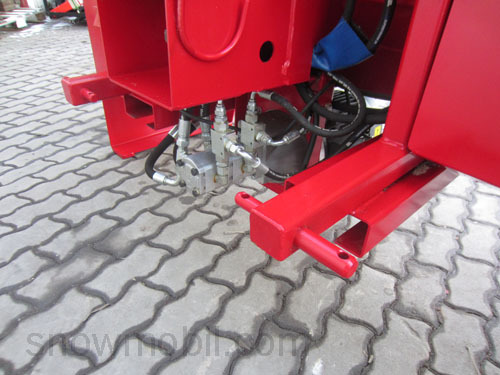 The PTO is not included as standart. 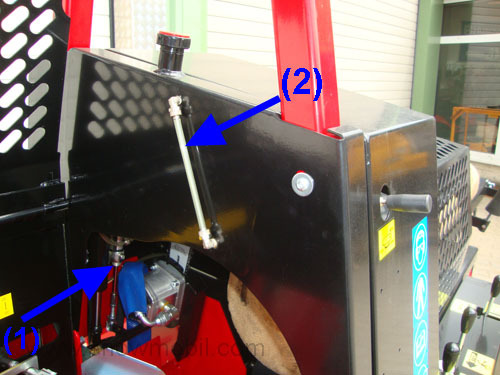 The splitting pressure rises depending on demand but the splitting speed is reduced by this way. The splitting force is at 8 tons, risable awhile (11 tons). Up to 3 m long logs can be placed on the table. A large contact surface is achieved by the roller-bearing, extended contact surface - that means long logs can not tilt. The log is moved by conveyor belt. 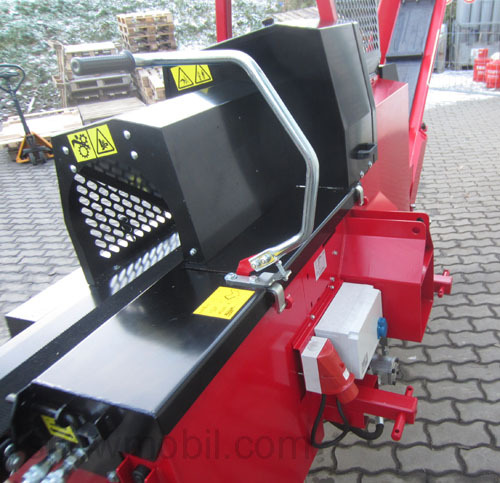 The conveyor belt is driven by a hydraulic engine. It is 2.30 m long and serves as an extended wood rest. 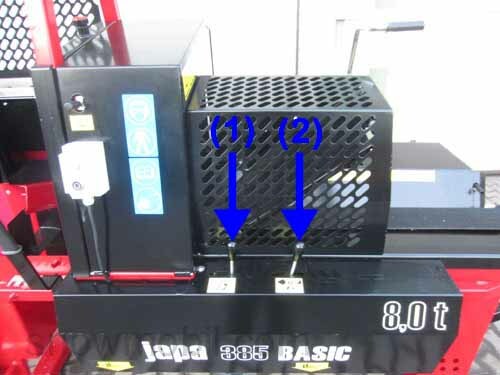 The three plastic rollers protect the log against rolling off. In the case of twisted wood it can also be removed. The length of the logs can infinitely be adjusted up to 55 cm. You only need to adjust the stop accordingly. 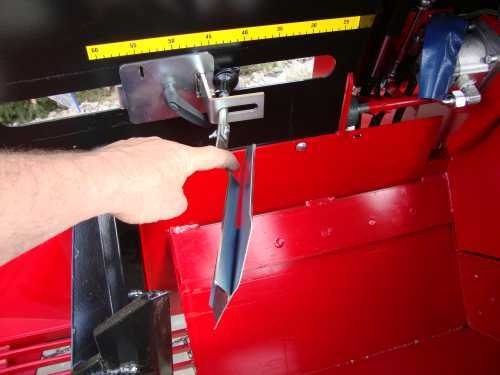 The splitting wedge can be moved in steps up or down with a hand lever. 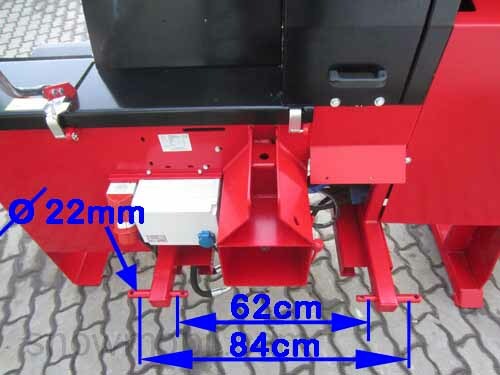 Depending on wood thickness you can split 1-way, 2-way, 4-way 5-way or 6-way. 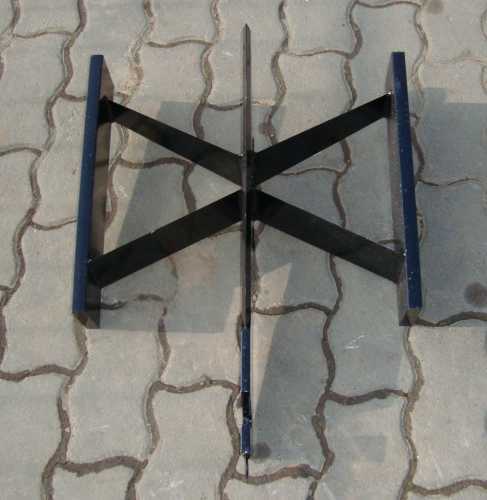 This is the 6x splitting cross, wich is not included as standard(=4-way). 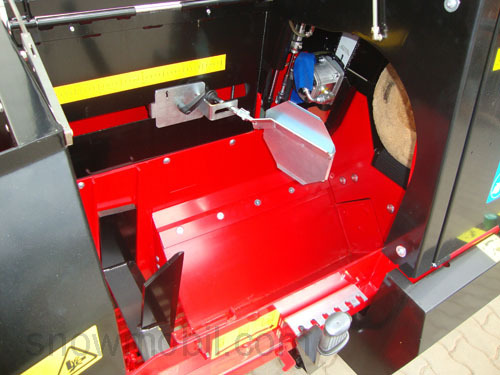 The splitting machine has a slit pressure of 8 tons. This seems not much for the layman. But in connection with the Easy-splitting cross it is entirely sufficient. 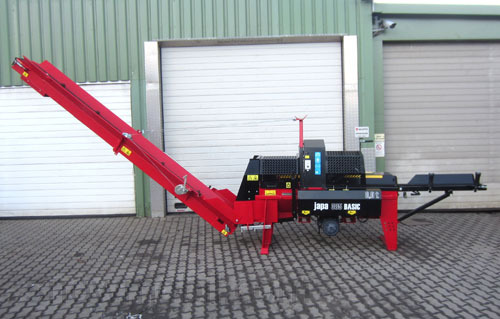 Whether beech, oak, birch or spruce (whether with many or not many branches) - the machine splits 99% of wood easily. A conveyor belt is included. 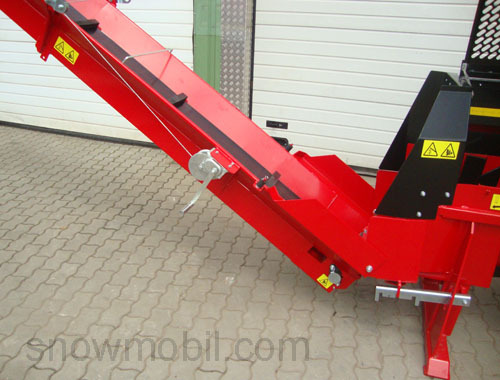 The length is 4,20m and it is driven by hydraulic engine, thereby the machine works completely independent!! 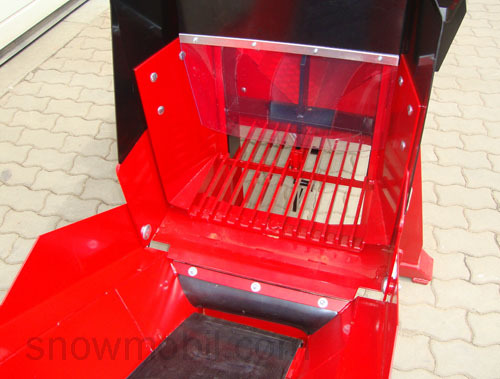 The conveyor belt can be folded to reduce the risk of tipping over and to reduce the headroom. It can be pivoted laterally. The conveyor belt is very wide with 30 cm. 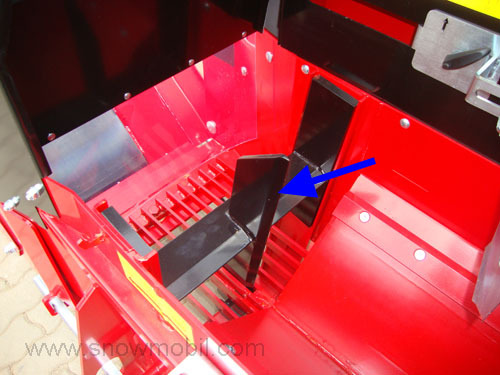 Here you see the full-hydraulic drive of the conveyor belt. A wide supply channel esodic to the feeding channel for a better timber drainage. 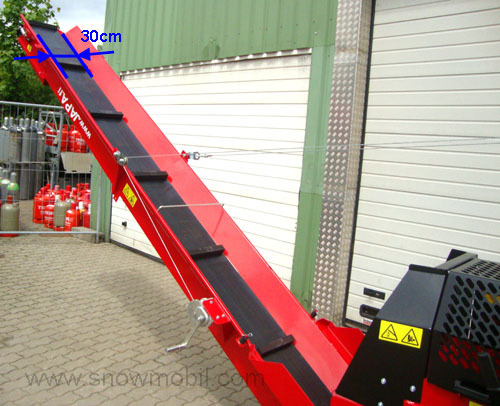 The conveyor is pivotable laterally to 3 positions up to 25 °. Here, the volume of oil for the lubrication of the chain is infinitely variable. Here is the the oil tank. 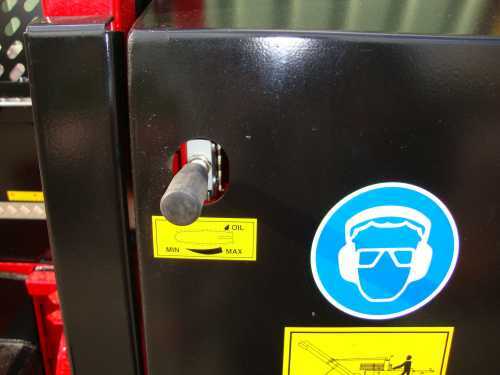 It is installed above the saw. Here you can see the hand lever for manual up and down of the splitting wedge. 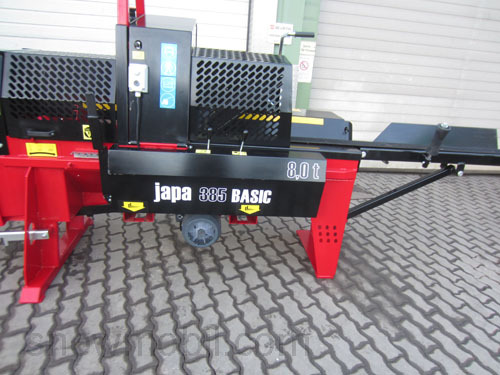 A lifting table/ log lifter or a wood trestle can be driven by the hydraulic connectors. 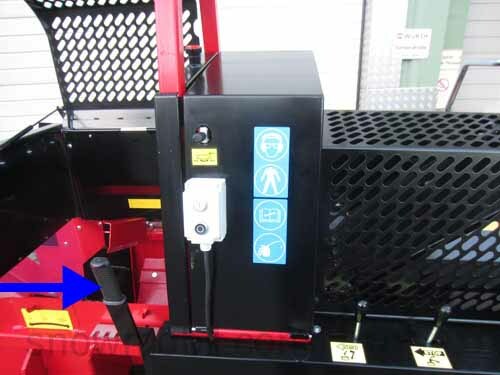 comes the wood trunk to the stop, the conveyor switches off automatically.